Adventurers are extraordinary people, driven by a thirst for excitement into a life that others would never dare lead. They are heroes, compelled to explore the dark places of the world and take on the challenges that lesser men and women can’t stand against. Class is the primary definition of what your character can do. It’s more than a profession; it’s your character’s calling. Class shapes the way you think about the world and interact with it and your relationship with other people and powers in the multiverse. A fighter, for example, might view the world in pragmatic terms of strategy and maneuvering, and see herself as just a pawn in a much larger game. A cleric, by contrast, might see himself as a willing servant in a god’s unfolding plan or a conflict brewing among various deities. 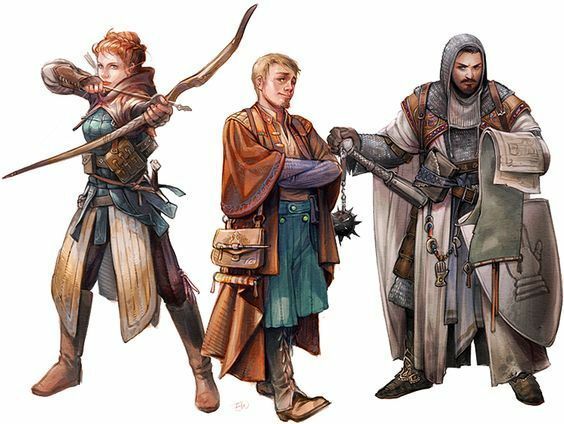 While the fighter has contacts in a mercenary company or army, the cleric might know a number of priests, paladins, and devotees who share his faith. Your class gives you a variety of special features, such as a fighter’s mastery of weapons and armor, and a wizard’s spells. At low levels, your class gives you only two or three features, but as you advance in level you gain more and your existing features often improve. Each class entry in this chapter includes a table summarizing the benefits you gain at every level, and a detailed explanation of each one. The Schön Culture column offers suggestions for your character's origins, however, there are no restrictions. If you choose to play a wizard from Baridor or a paladin of the ancients from Montega, you may. However, your character may belong to a very small order or even be unique. Artificer A spellcaster who uses their connection to the weave to forge magic infused items d8 Constitution & Intelligence Light armor, simple weapons. Artificers are found among the gnomes and dwarves as well as humans of Alaria and Dargaul. Barbarian A fierce warrior of a primitive background who can enter a battle rage d12 Strength & Constitution Light and medium armor, shields, simple and martial weapons. Barbarians are generally humans or hill dwarves from the wild regions of Nordania, Montega, the Plains of Thannon, and the Ragnar Mountains. The wild elves also gravitate toward this class. Bard An inspiring magician whose power echoes the music of creation d8 Dexterity & Charisma Light armor, simple weapons, hand crossbows, longswords, rapiers, shortswords. While uncommon among adventurer, bards are seen among all peoples. Cleric A priestly champion who wields divine magic in service of a higher power d8 Wisdom & Charisma Light and medium armor, shields, simple weapons. The religions of Schön are a largely monotheistic, worshiping Adonai. Clerics of the Faith are generally humans of the Realms of Sothis, though very few are empowered with spells, while clerics of the Way are humans and sometimes half-elves of Mantega. Clerics of the Maker's Craft are dwarves or gnomes, and the clerics of the Woven Path are elves. There are human, goblin, and half-ogre clerics among the Sects of the Dark Consortium. Druid A priest of the Old Faith, wielding the powers of nature—moonlight and plant growth, fire and lightning—and adopting animal forms d8 Intelligence & Wisdom Light and medium armor (non-metal), shields (non-metal), clubs, daggers, darts, javelins, maces, quarterstaffs, scimitars, sickles, slings, spears. Druids are worshipers of either Adonai in the form of the Shepherds of Sothis' Way or of one of the Dark Consortium as witches. Fighter A master of martial combat, skilled with a variety of weapons and armors d10 Strength & Constitution All armor, shields, simple and martial weapons. Fighters are found among all cultures. They are counted among the armies of each nation and the Baridorian Knights. Monk A master of martial arts, skilled with fighting hands and martial monk weapons d8 Strength & Dexterity Simple weapons, shortswords. Monks hail from the western monasteries of Taopan. Mystic A psionic who's forged a strong mental connection to use powers outside the weave of magic d8 Dexterity & Intelligence Light armor, simple weapons. Mystics are the rarest class. Paladin A holy warrior bound to a sacred oath d10 Strength, Wisdom, & Charisma All armor, shields, simple and martial weapons. Paladins are warriors called by God. While there are paladins among the Baridorian Knights and the Knights of Fey, they are very rare. Ranger A master of ranged combat, one with nature d10 Dexterity & Strength Light and medium armor, shield, simple weapons, martial weapons. Rangers are most common in Montega and other wild areas. Rogue A scoundrel and agile warrior who uses stealth and trickery to overcome obstacles and enemies d8 Dexterity, Intelligence Light armor, simple weapons, hand crossbows, longswords, rapiers, shortswords. Rogues are found in nearly every culture on Schön. Sorcerer A spellcaster who draws on inherent magic from a gift or bloodline d6 Constitution & Charisma Daggers, darts, slings, quarterstaffs, light crossbows. Sorcerers are rare outside of the elven lands and the humans of Alaria, Etrae, and Dargaul. Warlock A wielder of magic that is derived from a bargain with an extraplanar entity d8 Wisdom & Charisma Light armor, simple weapons. Warlocks are villains of Schön, making pacts with dark powers. Wizard A scholarly magic-user capable of manipulating the structures of reality d6 Intelligence & Wisdom Daggers, darts, slings, quarterstaffs, light crossbows. Wizards are only commonly found among the humans and elves of Alaria, the humans of Etrae, and the elves of the Forest of Dreams. For further information see the Magic section. Adventurers sometimes advance in more than one class. A rogue might switch direction in life and dabble in the cleric class while continuing to advance as a rogue. Elves are known to combine martial mastery with magical training and advance as fighters and wizards simultaneously. Optional rules for combining classes in this way, called multi-classing, can be found in the Player’s Handbook.